Healthy, glowing skin is an enviable trait, especially when it seems like you’ve tried every product on the market and are still left with dull, lackluster skin. There is a slew of problems our skin has to deal with nowadays, including fighting free radicals in the environment, everyday sun exposure and the aging that goes along with it, as well as a poor diet when our body is lacking in necessary nutrients. Luckily, the magical mud scooped from the floor of the Dead Sea can make your skin feel more alive than ever. 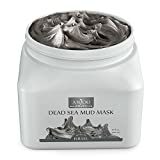 With a plethora of skin-loving benefits that include the reduction of pore size, stretch marks, blackheads, blemishes, and excessively oily skin, Dead Sea mud is sure to quickly become your new favorite beauty product. Located in Israel, the Dead Sea, whose name means “sea of salt”, is nearly ten times saltier than the oceans, which makes it one of the saltiest bodies of water on planet Earth. Because of this, people have been seeking out its various health benefits for thousands of years. 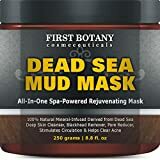 Here at Beauty Shortcutips, we’ve reviewed the top ten best Dead Sea mud masks. With options that are both natural and organic, you are sure to find one that awakens your lifeless skin. While reading through our list, keep in mind your specific skin type and what kind of results you wish to see. With its spa formula, this mask will not only help remove blackheads and other unwanted blemishes, but lift impurities and toxins from the skin out through your pores. With other natural ingredients like shea butter and sunflower oil, it won’t dry out your skin either. Older and drier skin will drink up these added ingredients like a sponge and leave it looking refreshed and rejuvenated. Enriched with important minerals, this mask removes dead skin cells to help skin-cell turnover. White Kaolin is an ingredient that will help to keep your skin moisturized the longer you wear the mask. If you have extremely dry skin, always look for a mask with kaolin or other oils (such as avocado or jojoba) in the ingredients list to ensure your skin stays plump and supple. This mask has all the same wonderful properties as the two previously mentioned, but only needs 5 minutes of drying time. This makes it excellent for people who are constantly on-the-go and have very little time to devote to a beauty regimen. Smear it on before you brush your teeth in the morning and it will be ready to remove a few minutes later. It could also be applied just before bed, then followed with your favorite moisturizer, to ensure optimal plumpness. We recommend you leave this mask on for 15-20 minutes for optimal drying time so it’s great for applying while you soak in the bathtub. It’s also a top pick for people with sensitive skin because the product has added organic extracts like aloe vera and calendula oil. These help to add moisture to the skin while simultaneously calming the skin. With up to 60% mineral content, this mask from Anjou has more mineral content than a lot of other masks on the market. Also, compared to the smaller 8-9 ounce jars of other products, Anjou’s jar is 17 ounces of product, which offers more bang for your buck. If you are someone who loves beauty products and/or likes to share them with your family and friends, this mask is perfect for you because you will have more product to spread around with people. Unlike other products, this mask from Premium Nature is unique in that it can help reduce the appearance of stretch marks. Whether the marks are on your stomach, legs, or back, this mask if the most likely one on this list to help rid your body of them. All the ingredients are 100% natural and the company offers a money-back guarantee if for any reason you don’t see the results you want. This mask includes jojoba oil in its ingredients list to ensure your skin stays moisturized throughout the process. It’s also great for other areas of the body besides just your face, including your legs and bum. Applying the mud to these areas can help improve the early signs of aging. Applying it 2-3 times per week will ensure you achieve the product’s maximum benefits. This mask is special because it includes lots of other awesome ingredients that are skin-enriching, including avocado oil and hyaluronic acid. The extra vitamins these ingredients provide supplemental benefits to your skin to help it glow from within. The Vitamin E from the avocado will keep it looking plump and refreshed long after you take off the mask. With all organic ingredients, this mask can assist in pore minimizing as well as detoxifying the skin of excess oils. The mask helps reduce the look of unwanted blemishes while it pulls impurities like blackheads from clogged pores. If you are someone who suffers from oily skin, this mask will be great for your skin type. Sol Beauty also offers a money-back guarantee so you can buy with confidence. This mask is 100% natural with all organic ingredients which means there are no unnecessary additives and the formula is free of chemicals. People with super sensitive skin can rest easy knowing this mask will not cause any skin irritations or reactions. Rich in minerals, it offers a rejuvenating effect on the skin as it clears pores of gunk like blackheads and excess oil. As you experiment with different masks to find the perfect one for you, consider keeping an eye out for anti-aging ingredients like hyaluronic acid and avocado oil because they can help prevent and/or reduce early signs of aging. Whether you are in your teens, twenties, thirties, or even sixties, it is never too late (or too early!) 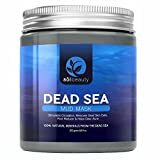 to start taking great care of your skin and mud from the Dead Sea is one of the best ways to do that. Don’t forget to prep your skin before you apply your mask and finish up with some type of moisturizer afterward. This ensures stays calm, healthy, and glowing throughout the whole process. Do not leave your mask on for longer than the recommended amount of time. Leaving the mud on your skin for too long can create excessive dryness. If this occurs, immediately rinse the mud from your face, pat your skin dry with a clean towel, and follow up with a facial moisturizer. Apply your mask 2-3 times per week. If excessive dryness occurs, reduce the number of times per week you apply the mud. If you would prefer not to use your hands to apply your mask, you can use an old makeup brush with flat bristles, or a small spoon or spatula. Make sure you keep the lid on your tub of mud sealed tightly. If air gets into the container, the mud may dry out. Be sure to store your mud mask in a cool, dry place to avoid spoiling the mud. When looking through your options, be sure you read the label of ingredients. There may be companies who make fake products and try to use salt that is not sourced from the Dead Sea. By double-checking to make sure the product is from Israel you will ensure you get authentic ingredients. It is okay if the product was packaged or manufactured in another country. In addition to applying Dead Sea mud masks, staying hydrated by drinking lots of water will help your skin look more hydrated. Another change to your diet you can make for effective results is to incorporate some of the ingredients found in the masks themselves, like avocados. you can use an old makeup brush with flat bristles, or a small spoon or spatula. ​or try these mud mask brushes. Clearing out the gunk from your pores is no easy task, but with any one of these ten powerful mud masks the task should get much easier. 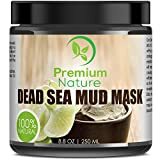 Remember, the benefits of using Dead Sea mud on the body include, but are not limited to: reduced appearance of stretch marks, blackheads, blemishes, pore size, prematurely aging skin, excess oil on the skin, and many more! 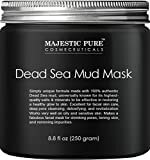 Beauty Shortcutips hopes this list helps you weed through the saturated market of Dead Sea masks to find the perfect one for your skin type. For further information, read up about the Dead Sea and its amazing properties. 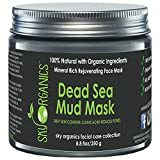 Dead Sea Mud really has a lot of skin beautifying properties that will improve the appearance of our skin. There are a lot of them available in the market. It contains Bentonite Clay and this mud mask also promotes and stimulates Circulation, Removes Dead Skin Cells, and also helps clear Acne.